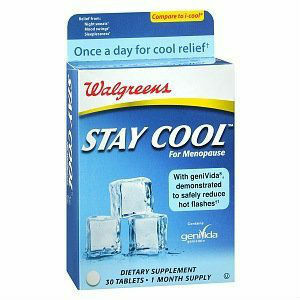 Walgreens Stay Cool has been clinically proven to alleviate menopausal symptoms like hot flashes, night sweats, sleeplessness, irritability, mood swings, vaginal dryness and general loss of interest. It restores energy and helps the mind concentrate better. Genistein (geniVida) – Genistein is an isoflavone or phytohormone, which mimics the properties of human estrogen and allow the body to cope with the natural decline of estrogen production during menopause. It is extremely helpful in reduction of symptoms like hot flashes, etc. associated with menopause. Recommended daily dosage is one capsule per day with a meal at a fixed time of the day. Stay Cool does not contain soy or gluten and is hypoallergenic. Each pack costs $14.49, but is currently available in a 1+1 scheme, lowering the effective monthly cost to $7.25. This is much cheaper than most other menopause supplements available in the market. The company offers a 100% money back guarantee. If you are dissatisfied with the product, you can return it within 30 days of purchase for a full refund including shipping cost. This seems to be a good product. It is natural and made from plant hormones, so is a suitable replacement for human hormone therapy without causing any major side effects. Stay Cool costs only $7.25 per month. However, since this product is cheap, comes with a guarantee and has been found effective in clinical studies, it is definitely worth a try if you are suffering from hot flashes, night sweats and mood swings because of menopause. Jackie Horowitz	reviewed Walgreens Stay Cool	on July 29th	 and gave it a rating of 3.